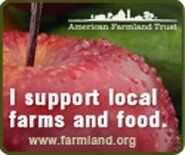 New demands from a dynamic global economy, continued decline in the quality and availability of natural resources, and the unprecedented challenges of climate change are just beginning to take their toll on the U.S. food system. That’s the starting point of Laura Lengnick’s book Resilient Agriculture, Cultivating Food Systems For A Changing Climate (New Society Publishers, Gabriola Island, British Columbia, Canada, 2015), which she researched and wrote in what seem now like the halcyon days of 2013-14, when the Obama administration’s responses to the challenges of climate change had begun to build some momentum, however slow. Now, with the U.S. government taken over by the corporate interests who profit from All Things Unsustainable – to the point of completely denying the irrefutable man-made contributions to global warming – her book takes on more urgency than ever. Ironically, it argues that we can change our farming ways without governmental assistance, an approach that seemed amusingly maverick until Jan. 20. Now it’s absolutely vital if we want to continue to eat well even as the waters rise. Lengnick visited 25 farmers across the United States, choosing those who had been in that business for at least twenty years, noting that many of them were fourth- or fifth-generation families working the soil. As increased flooding and temperature extremes continue to exact a toll, Fuller relies on a cover-crop cocktail that “keeps the system alive. It keeps the microbial community fat, the earthworms fat.” A sidebar offers a USDA-developed Periodic Table of Cover Crops showing the mix of broadleaf, grass, and legumes that can be developed to suit a particular climate, aiming both for the best in-ground diversity as well as a response to herbicide-resistant weeds. Although temperature extremes and catastrophic weather events also plague the northeast, the climate in that area has been volatile even before climate change exacerbated things. Even so, the challenge for Jim and Adele Hayes of Schoharie’s Sap Bush Hollow Farm has been to accommodate the increase of dry spells by leasing more land for the livestock – they specialize in sheep, but also raise beef, poultry, and pigs – that they pasture. But their biggest recent problem came with two consecutive hurricanes in 2011 that washed away bridges and knocked out power. They were able to get through with the reserves of feed and generator-powering fuel they had on hand, but have since worked to add solar power and a reserve battery system. Although the case histories are the heart of the book, Lengnick leads us into them with an illuminating history of the cultivation of plants and animals to help contextualize the stories, further illuminated by economic history. Thus, we can see how increased mechanization and single-crop farming drove profits higher even as it consolidated the industry, marginalizing the small farmers who once were the industry mainstays. But the unsustainable practices of the corporate giants leave them ill-prepared to deal with drastic changes in weather. Smaller, savvy farmers are better equipped to roll with the punches, provided they’re able to see the ramifications of what’s ahead. Resilient Agriculture makes no pie-in-the-sky promises, but offers warts-and-all case histories – each of which offers a template for sustainable growth. 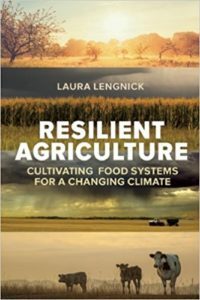 Lengnick, herself a farmer, spent a decade leading the program in sustainable agriculture at North Carolina’s Warren Wilson College; she also contributed to the third National Climate Assessment as lead author of the USDA report Climate Change and Agriculture in the United States. So she brings a feet-on-the-ground experience to the eminently readable book, rendering even the wealth of technical information in accessible form. Whether you’re a hobbyist farmer or one who’s struggling to make a living off of the land, Resilient Agriculture is a necessity – and it’s a valuable resource to anyone who wishes to eat more responsibly as well. It will help lead us through the sky-darkening days ahead.